Here are a few reasons why your child should give a sensory gym a try. If your child struggles with autism or another sensory processing disorder, then you may be concerned about finding ways to help them. But what is a sensory gym exactly, and how can it help? Sensory gyms are fun places for children with sensory processing issues to learn and develop their senses in a safe environment. Here are a few reasons why your child should give a sensory gym a try. Much like any other gym, a sensory gym is designed to provide achievable challenges to strengthen your child. 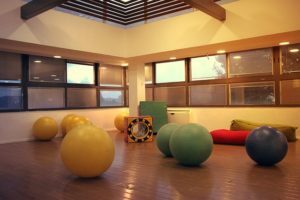 In this case, a sensory gym provides games, toys, and activities that encourage your child to build their tolerance and exposure to different types of stimuli. Many of these activities will also encourage them to get moving and let out their energy. If your child is uncomfortable participating in group sports, then a sensory gym is a great start to teaching them the importance of getting exercise. Sensory integration is an important part of brain development, and it is how every person learns to use their senses to interpret the world around them. If your child is having trouble obtaining sensory integration skills, then a sensory gym will lead them in the right direction. Many sensory gyms will have things like textured portions of the wall or floor to help reduce tactile defensiveness for example, or sections with soft, colorful lights and music. The goal is to help your child get a grasp on their senses by introducing them to different stimuli that they can explore at their own pace. As a parent, you know how hard it is to make the choice of whether to take your child with a sensory processing disorder to a playground. In many cases, there are concerns for their safety, but it can be disheartening to have them miss out on the fun. A sensory gym gives your child the opportunity to play and have fun in a place that is suited to their needs. Because sensory gyms are designed for children with autism and other sensory processing disorders, people there will be understanding of your situation. Many gyms also have fun places to climb, and swings for vestibular sensory stimulation, similar to ones at a playground. This entry was posted on Monday, April 8th, 2019	at 3:48 pm	. You can follow any responses to this entry through the RSS 2.0 feed. Both comments and pings are currently closed.